Although long, IN THE WOODS is a cracking read. I have often read the word "unputdownable" to describe a book, but in this case it is true: I was glad I started the book on a weekend and had no other commitments, so I could finish it in a day. Adam Ryan has fulfilled his lifelong ambition to become a detective in the Irish police force. But because of a tragic event in his childhood, in which two of his friends vanished, never to be found, he calls himself "Rob" Ryan and does not reveal his past. He's best friends in a platonic way with fellow-detective Cassie, and near the start of the book the partners take on a case of a young girl who has been found murdered at an archaeological site – in the very same woods where Rob's friends had disappeared more than 20 years ago. Rob feels compelled to investigate the case as he's convinced it must have something to do with the earlier tragedy: so he persuades Cassie, who knows his secret, not to confide in their superiors. Most of the rest of the book describes the details of the police investigation: the interviews of the idealistic archaeologists who are hurrying to complete their excavation before a new motorway is built; the residents of the nearby estate where the girl lived; and local businessmen who have been threatening the dead girl's father, who heads up the protest group to try to stop the motorway from being built. Events are filtered through Rob's vision, so the reader experiences his panic and paranoia about the case, and his increasing sense of unease. Rob is close to Cassie, but keeps her at arm's length. He lives in a flat rented from an ex-girlfriend, who is presented in an unflattering light – but Rob liked her well-enough once, and the reader is aware that events in Rob’s past seem to inhibit him from being able to relate not only to girlfriends but also to his parents and his police colleagues. The phrase "screwed up" seems designed to apply to Rob. IN THE WOODS is a long book, but does not fall for the easy solution of providing more bodies to help the detectives solve the crime, and sustains a high level of relentless tension throughout. In fact, the villain is easy for the seasoned reader to identify, but even so this does not matter, as the way in which the case is solved is chillingly suspenseful, and the writing style superb (although one of my pet hates of crime-fiction, the "fine-tooth comb" makes a couple of appearances). The conclusion of the case is pretty downbeat. It is always hard to review crime fiction books in much detail without giving the game away, but almost everyone ends up being disappointed in some way; even though the case of the young girl is solved in the sense of the murderer being identified, the story surrounding her death is genuinely creepy. I was sorry that the older mystery was left in the way that it was, but maybe we will find out more if Rob Ryan returns in future. 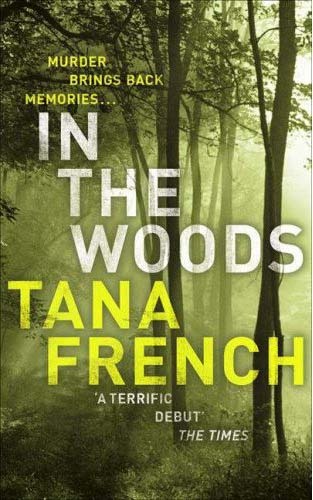 It isn't clear that he will, however: Tana French's next book, THE LIKENESS (not yet published) will feature Cassie, who although secondary to Rob in IN THE WOODS, is certainly sufficiently intriguing to justify being a more central character in future. I'm looking forward to finding out what she does next, although I'd be disappointed not to find out any more about poor, sad Rob.